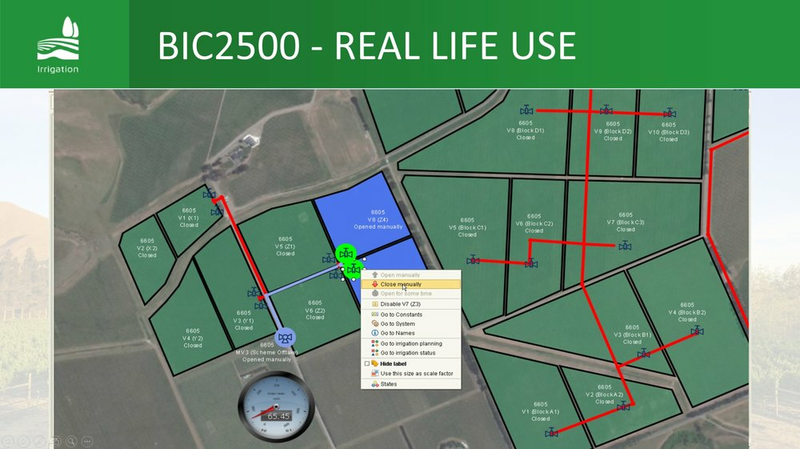 Currently few practical links exist between these tools, the decision making about irrigation is still, often, a completely manual task left to the grower. •	Run several irrigation programs at the same time and from the same controller unit, allowing for multiple irrigation lines, pumping systems, blocks and properties. •	Run simultaneously multiwire, 2Wire and radio communication (up to 30km) for flexible retrofitting and futureproofed developments. •	Give access to full monitoring and control via smartphone or computer dashboard, including live property map and graph views. • Unique and innovative modular PC mechanism. • Easily change full circle sprinkler into part circle sprinkler and vice versa. • Unique hammer combined with SD (Super Diffuser) plate designed for uniform distribution even at low operation pressure (1.5 bar). • Spacing up to 14 m.
• Combining with full-circle sprinkler ensures that 100% of the water remains within the irrigation area. • Wide range of flow rates makes it the ideal partner for every full-cricle sprinkler in any crop or field. • High-impact, heavy-duty plastic materials provide resistance to corrosion, chemicals and UV radiation. The range of sprinklers are split to two groups. Red sleeve with 2.5mm and 2.8mm and the black sleeve with 3.0mm and 3.2mm.